Last year about this time, I posted Robert Parker’s 1976 side, “A Little Bit Of Something (Is Better Than A Whole Lot of Nothing)”, arranged by Wardell Quzergue for Allen Toussaint and Marshall Sehorn’s Sansu Productions; and I speculated about who might be playing on it, guessing at least a few of the Meters were sitting in. On “You See Me”, from 1969, it is quite probable that all of the Meters made the session, mainly due to the fact that they were the company’s recently acquired session band at this time and were already regularly working on their own projects and behind such artists as Betty Harris and Lee Dorsey, under Toussaint's direction. 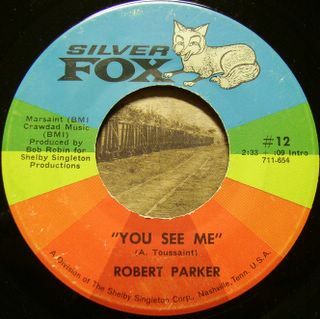 Toussaint and Sehorn took on Robert Parker after his previous label, NOLA went under, around 1968. The label owed a large amount of money to Cosimo Matassa’s Dover Records in a production and distribution deal, which contributed to the demise of Dover. Many small labels in New Orleans had arrangements with Matassa’s company; and, when Dover became insolvent, a lot of them essentially ceased to exist, losing their access to recording time on credit and to distribution outlets. Toussaint and his partner's own stable of labels, Sansu, Deesu, and Tou-sea, was hurt by the Dover debacle, too; but Sehorn had many contacts in the music business through years of representing labels and was able get national distribution for their bigger name acts (Lee Dorsey, Aaron Neville, the Meters, and Robert Parker) through other companies such as Amy/Bell, Mercury, Josie, and, in Parker’s case, Shelby Singleton’s Silver Fox and SSS International. Once the Meters started having hits, Sehorn got them a deal with Warner Brothers, which also signed Toussaint as a solo artist. With that national label support, the partners were able to open their own studio, Sea-Saint, in 1973. From there on out, the Sansu Productions operation was focused mainly on album deals for their artists and for Toussaint as producer. This is why you don’t see many singles by lesser known local artists produced by Toussaint after the early 1970’s. Isaac Bolden mainly took over that aspect of production for the limited amount of single projects that Sansu oversaw or issued in the 1970’s. “You See Me” is one of the 45’s turned out by Toussaint and Sehorn during the post-Dover transition in New Orleans recording. While not primarily a funk record, it has a poppin’, swingin’ groove to it and a little syncopation. As I’ve said before, Toussaint kept a tight rein on his arrangements, wanting the Meters, as great as they were at improvisation on their own material, to follow his direction behind other artists. When I hear this track,I always think of The Band, as Parker’s vocal sounds somewhat similar to Levon Helm; and the track has that roots rock/R&B feel the group, who were coming on strong in 1969, could do so well. It’s no surprise that the boys in The Band soon asked Toussaint to do the arrangement for “Life Is A Carnival” and, later, for the horns at the Last Waltz concert. Whether its Band feel was a conscious decision on Toussaint’s part, “You See Me’ is a great record from the era that deserved more than the obscurity to which it was quickly relegated. Parker’s second Toussaint production, released in 1970, SSS International 819, “Hiccup” b/w “Rockin' Pneumonia”, fell on deaf ears, too. In the mid-1970’s, his work with Quezergue at Sea-Saint resulted in three promising singles released on Island. “Give Me The Country Side Of Life”, off the second of those, was a popular local record, but did not chart nationally. With no further action from the singles, it appears that Parker made no further recordings. For an outstanding overview of Robert Parker’s background, especially his 11 singles for NOLA, starting with his only hit, “Barefootin’”, please see Larry Grogan’s Funky 16 Corners webzine. And you can find a fairly complete discography at Soulful Kinda Music. This side as well as many from Parker's 1970’s sessions are available on the AIM CD, Barefootin'. and frustrating (read more...) - good luck!